A selection of Brazilian gemstones. (From top, clockwise): rubellite tourmaline, emerald, aquamarine, imperial topaz, yellow topaz, bicolor tourmaline. Center: Paraiba tourmaline and brown diamond. Photo by Robert Weldon/GIA. 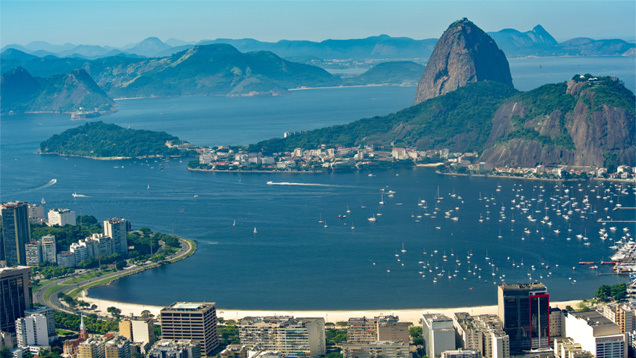 Brazil is a tropical locale well-known for exotic animals and plants, futból, sandy beaches, and jungle-clad mountains. Some of these mountains rise like monuments in the middle of cities, such as Sugarloaf Mountain in the ever-colorful and playful Rio de Janeiro. The country also contains the renowned Amazon River, not to mention superb gemstones in a kaleidoscope of saturated, luscious colors. Brazil’s rich natural gemstone resources include many varieties of tourmaline, topaz, beryl, and quartz, among others. If you’re a gem lover, Brazil is the dream destination, sure to top your bucket-list of must-see places in the world. So as you plan your dream vacation, read these travel tips and information to help you get the most of your trip to Brazil. 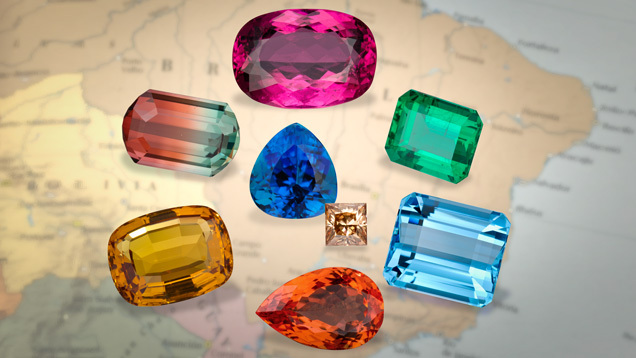 In tourmaline alone: orange, yellow, green, blue, and violet varieties hail from almost every corner of this enormous country. They are particularly found in Brazil’s state of Minas Gerais (a name which appropriately translates to “General Mines.”) It is also home to Paraíba tourmaline, a unique, electric blue-green variety, which derives its color from microscopic traces of copper. These gems are found in the northern state of Paraíba, to which they owe their name. Occasionally, the colors in tourmalines are mixed, resulting in bi-color or multicolored gemstones. There’s enough choice in tourmaline to capture everyone’s fancy. Almost every member of the beryl family is represented as well: ocean-blue aquamarines and leafy green emeralds, delicate pink morganites and bright yellow heliodors make up this interesting Brazilian gem family. Cat’s-eye chrysoberyls and the extremely rare color-change alexandrites are found in Brazil as well. Other gems you might not necessarily associate with Brazil are found here too, such as opals with strong play of color, as well as fire opals. Garnets are found in Brazil as well, and delicately-hued pink kunzite. Few people are aware that Brazil was once the foremost source of diamonds, and that it remains an important source still today. In the 1700s and early 1800s, some of the world’s most celebrated diamonds were found in this enchanting land, including extremely rare red diamonds as well as green, and other fancy colors. Alluvial diamonds continue to be found in Brazil, mostly mined from riverbeds and from conglomerate host rock. The sprawling cities of Rio de Janeiro and São Paulo are both hosts to some of Brazil’s most venerable jewelers, such as H. Stern, Amsterdam Sauer, Natan, and Manoel Bernardes. Beyond these two metropolises, each of these jewelers also has retail outlets in Brazil’s principal cities and in many hotels and airports. 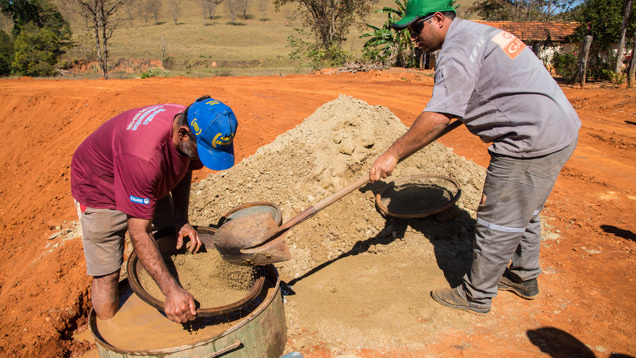 They have deep roots to the gem sources of Brazil, in many cases owning mines in Brazil’s interior. H. Stern is famous for taking busloads of newly arriving international passengers to its premiere headquarters in Rio de Janeiro. A tour of the facilities includes a walk through a virtual mine, a chance to see gemstones being cut and polished, and a glimpse behind the scenes to observe jewelry being made. It is a unique mine to market experience with a special Brazilian flair. 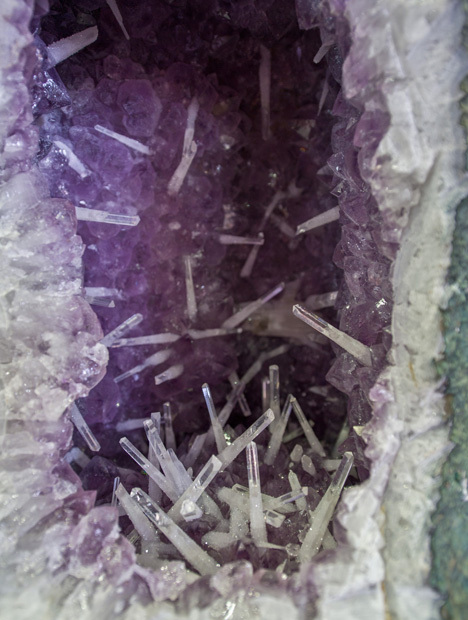 Amsterdam Sauer has a museum that features Brazil’s most celebrated minerals and gemstones. The city of Belo Horizonte in Minas Gerais has one of the country’s most important gem and mineral museums, the Museu das Minas e do Metal. 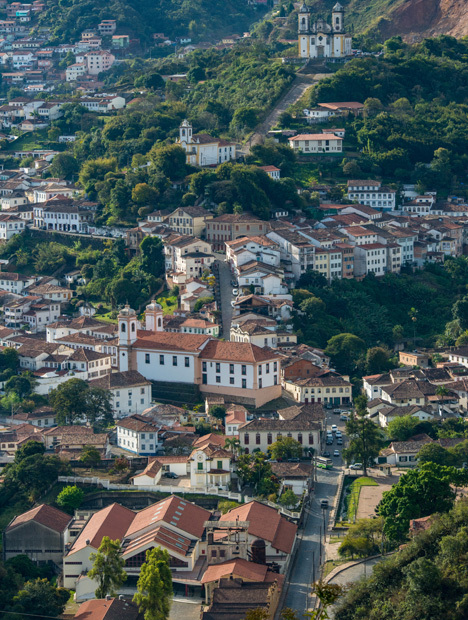 If you are traveling in the interior of Minas Gerais, the Baroque Colonial city of Ouro Preto is a must-see for its picturesque architecture, spectacular churches, and rolling hills. It is near to the imperial topaz mines and a gold mine that you can visit. Diamantina is also a Baroque colonial city that was once the center of the diamond business in Brazil – hence the name. Both of these towns are UNESCO world heritage sites. If you’re traveling in Brazil, a few words of caution. Because of disparity in incomes and rising populations, visitors need to be aware of some dangers. As anywhere in the world, tourists need to be cautious of pickpockets and theft. Even though Brazil is extremely photogenic, cameras and other valuables such as cell phones and jewelry should be kept concealed as much as possible in larger cities. In fact, we recommend leaving your most valuable jewelry behind to remove the possibility of it getting lost or stolen. Rio de Janeiro has made great inroads in halting crime along its beaches, but petty theft remains ubiquitous, even in broad daylight. This threat diminishes dramatically as a traveler goes into smaller towns and villages in the interior of Brazil. Rio de Janeiro is famous for its beaches and also for Sugarloaf Mountain (Pão de Açúcar), a peak that rises dramatically in the middle of the city of Rio de Janiero. A trip to the summit of Corcovado is a must, from where you can see the spectacularly beautiful layout of the city with its bays and inlets and islands. If you have a chance to witness a soccer game at the famous Maracana stadium in Rio, you will experience Brazilian fervor at its zenith. São Paulo is in Brazil’s interior, devoid of Rio’s laid-back beach atmosphere. It is a sprawling metropolis filled with art galleries, malls, gardens, cathedrals, and swanky restaurants. São Paulo was the Portuguese colonists’ springboard to the discovery of Brazil’s interior in the 1600s. Brazilians love meat. When you’re in any big town in Brazil, a visit to Fogo de Chão, or other churrasquerias is a must, though you should arrive with an empty stomach. For those who prefer to skip the meat at the famous Brazilian steakhouses, the salad bar will supply ample diversion. Pão de queijo, a small cheese-laden bread made with yucca flour, is found throughout the state of Minas Gerais, which is a huge agricultural region (in addition to mining). Feijoada is a bean-based meat and corn stew that is enjoyed across Brazil. A variation of stew called moqueca in which seafood is cooked in coconut milk, is found in coastal cities to the north, such as Salvador in Bahia. Yum! Brazil and its people are among the world’s warmest and most hospitable. It is one of the greatest gemstone sources in the world where you will also be able to enjoy the deep-rooted culture, the country’s delectable food, the passion of its people, and the spectacular landscapes. When you go home, take a gemstone with you. You’ll be returning with a small piece of Brazilian real estate, and memories to last a lifetime. Before you pack your bags for your trip, you might want to brush up on your gem photography skills with these 6 Tips for the Best Gem Photos. 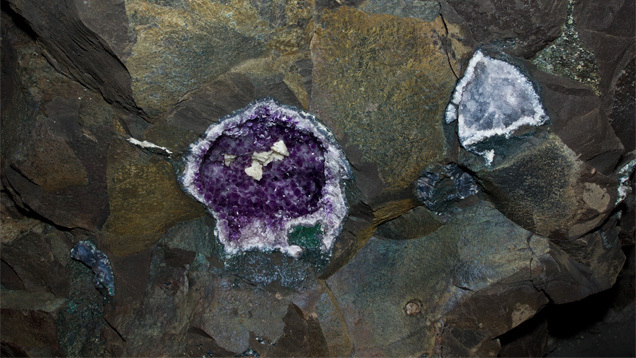 Robert Weldon travels the world documenting the story of gems and minerals. His work appears regularly in the scientific journal Gems & Gemology, GIA’s website and course materials, as well as magazines and other publications. He is the manager of photography and visual communications at GIA in Carlsbad, California.